Uncharted: Big Data as a Lens on Human Culture by Erez Aiden and Jean-Baptiste Michel has been published! On the Cover of Science! Quantitative Analysis of Culture Using Millions of Digitized Books. Jean-Baptiste Michel*, Yuan Kui Shen, Aviva Presser Aiden, Adrian Veres, Matthew K. Gray, The Google Books Team, Joseph P. Pickett, Dale Hoiberg, Dan Clancy, Peter Norvig, Jon Orwant, Steven Pinker, Martin A. Nowak, and Erez Lieberman Aiden*. Science 331 (2011) [Published online ahead of print: 12/16/2010]. Read it here! Culturomics also appears on the cover of Science! The image is a photograph from Idiom, a sculpture from Matej Krén currently showing in Prague. On December 16th, 2010, a team spanning the Cultural Observatory, Harvard, Encyclopaedia Britannica, the American Heritage Dictionary, and Google published a paper describing the Culturomics approach online in the journal Science, and at the same time launched the world’s first real-time culturomic browser on Google Labs. 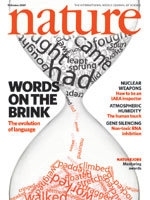 Quantifying the Evolutionary Dynamics of Language. Erez Lieberman*, Jean-Baptiste Michel*, Joe Jackson, Tina Tang, and Martin Nowak. Nature 449 (2007). Read the paper here! News & Views. Favorite Nature paper in Linguistics for 2007! Image: “Verb size corresponds to usage frequency, so large verbs stay at the top, and small verbs fall to the bottom. ‘Wed’, the next irregular verb to go, is on the brink.” Courtesy of Jonathan Saragosti. Nature, Oct 11, 2007.